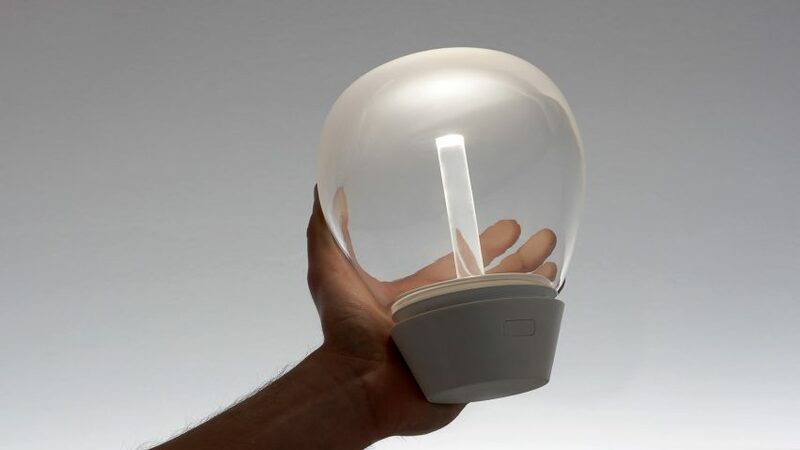 Italian lighting company Artemide is the latest brand to add portable lighting to its collection with its cordless Emera and Empatia Mobile lamps. Emera – designed by Artemide co-founder Ernesto Gismondi and designer Daniele Moioli – features a disc-like shade with embedded LEDs. A cone-shaped base conceals the battery. "The shape was born from both functional and technical needs," Gismondi told Dezeen. "The gradient of the cone body reflects the angle of light which is emitted." "We wanted to make a portable light to create flexible atmospheres for the user that are able to adapt to the ever-changing organisation of space." Emera launched at Milan design week, where portable lighting has become increasingly common in recent years. Philippe Starck told Dezeen at the 2015 event that advances in lighting technology meant cables would gradually disappear. Artemide released its first cordless light even earlier, in 1999. Called the Sui, it rested on a flexible stem and had a flat head dotted with LEDs. Alongside Emera, Artemide also launched Empatia Mobile, which features a dome-shaped glass shade. According to the company, it references traditional Venetian glass blowing traditions. Designer Carlotta de Bevilacqua created the shape to be reminiscent of traditional lamps, concealing its rechargable elements in the base. A central "light pipe" – which replaces the candle used in a historic lamps – transmits light from the LED in the base. "Whilst technology is moving forward, we have seen that people are actually returning to more traditional lighting scenarios," said de Bevilacqua. "Portable does not only mean that light can be taken where it couldn't go before, but it also opens up a new flexible version of more traditional lighting scenarios and ambiances." German designer Simon Diener also recently created a portable light, designing a wrap-around cord and counterweight battery that allows it to be suspended from various surfaces. Barcelona brand Marset's Ginger lamp is similarly designed to be carried from room to room, and Francisco Gomez Paz created an eco-friendly take on portable lighting, with a cordless lamp that generates electricity from bio ethanol. Artemide was founded in Milan by Ernesto Gismondi in 1960. It has collaborated with several well-known designers and architects, including Enzo Mari, Richard Sapper and Herzog & de Meuron – whose recent series of table lamps was originally designed for a museum. At this year's Milan design week the Italian company also unveiled a range of lights that resemble birds perched on wires, created by Neri&Hu.